Orth & Associates, Inc. is a professional real estate appraisal company with a 18 year history. Our knowledgeable staff of State-Certified Appraisers can accommodate all aspects of residential valuation in Manatee, Sarasota and Charlotte counties, Florida. About us: Over 25 years experience home - appraising Manatee, Sarasota, Pinellas and Charlotte Florida real estate appraisers and our Manatee, Sarasota, Pinellas and Charlotte Florida appraisals. Our appraisals comply with Florida real estate appraisal law and the Uniform Standards of Professional Appraisal Practice (USPAP). from 1-4 Units, and Vacant Land. 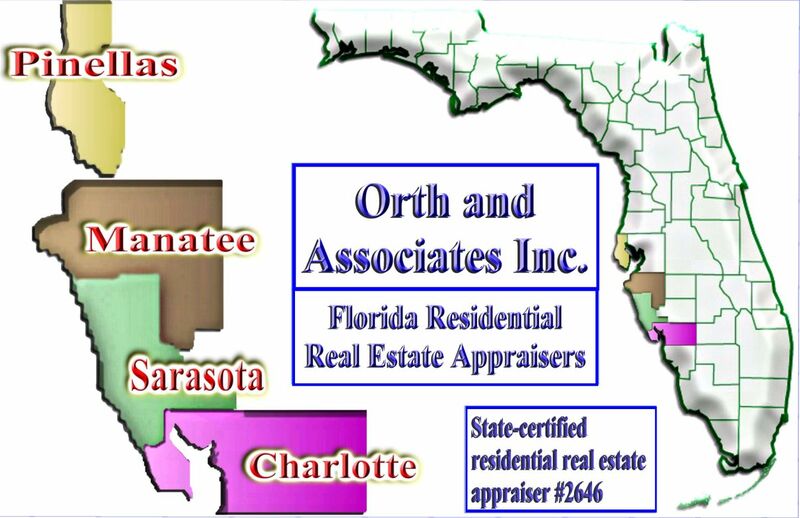 The goal of Orth and Associates Inc. is to provide real estate buyers and sellers with exceptional appraisal services within the geographical areas of the west coast of Florida. Our expertise extends throughout Manatee County, Sarasota County, Pinellas County and Charlotte County. This includes the cities of North Port, Venice, Englewood and the barrier islands of Longboat Key, Siesta Key and the surrounding isles within Punta Gorda. Orth and Associates, Inc. offers a solid commitment to customer satisfaction offering fast, efficient service. Orth and Associates provide all our clients a high degree of Professionalism, Integrity and Reliability. Orth and Associates realize that our clients depend upon rapid turn-around and accurate appraisal reports. Orders are managed and monitored daily to guarantee that the fastest appraisal possible is achieved. Orth and Associates utilizes the most modern technology available including cutting edge software and computers, digital photography, operational web page marketing, CD mapping and fully networked, high-speed Internet access. Copyright © 2005-16 Orth & Associates, Inc. All rights reserved.